New challenges are coming thick and fast for all of us: getting to grips with new assessment objectives, exam formats and marking systems as well as whole new topics to teach. For those of us planning schemes of work, the linear course gives a welcome flexibility, but this lack of a fixed half-time marker can feel confusing and even scary. I’d been feeling smug about Schemes of Work, all planned in February as a team effort with the HoD I was going to be covering on maternity leave. But smugness never lasts and the goalposts moved, followed by the whole pitch! First, the school decided students would not sit AS exams in linear subjects, opening up a whole new set of possibilities. Shall we incorporate research methods and statistics with other topics, teach them in parallel, or hit them in an intensive block? Why not just carry on and teach all the Approaches and Biopsychology together? When and how should they do research projects? And how were we going to a) make them study seriously from the outset with no exams in Year 1, and b) revise 2 years’ worth of stuff in Year 2? I planned two versions of my Year1 SoW and mentally flipped between them, pondering. My first solution to Year 2 was to fit in as much as possible into the end of Year 1. I set my students up with a research project to carry out independently during study leave. The final four weeks were just enough to crack through the two extra Approaches and the rest of Biopsychology. I was competing with the lure of uni open days and summer jollies, so instead of writing essays they did the lovely graded activities in the Revision and Exam Companion (Year 1) for homework and interspersed with delights such as making neurons out of sweets, and a Brain Day with Guy Sutton. My next big challenge was unexpected, and I was back to square 1 with the planning, when I successfully applied for a permanent HoD job at a school I know and love. Happy days! Luckily their classes have also cracked off Approaches and Biopsychology, so we are starting from the same place, but with two teachers for each class. I have decided to launch into Issues and Debates first as this gives an opportunity for recapping key studies from year 1, cranking up deep psychological thinking after the summer, and providing high quality tools for evaluation within the optional topics. I can see why IDAs were compulsory in PSYA3, as thinking like a psychologist has to involve fluent consideration of relevant issues and debates. The Issues and Debates have now been honoured with their own special exam section so they will need focused attention, but higher level evaluation points throughout all papers will need to be based around a discussion, probably linked to Issues and Debates, or Methodological Issues. So I reckon it’s worth hitting this wonderfully philosophical topic hard at the outset of Year 2. There are some very useful resources in the Teacher’s Companion, in particular an article written by a traumatised research participant, highlighting the complexity of ethical issues in research. I’ll also include tantalising tasters of things to come in the options (I’ve chosen Schizophrenia, Gender and Forensic). The other teacher will dive straight into the first option, to keep things grounded. Thereafter, I’m planning brief recap times for approaches before exploring different explanations within a topic. We will use the Year 1 Revision and Exam Companion’s summaries to revise these, and I’m going to suggest that students may find it useful to have a copy of the Mini Companion tucked in their bag for easy reference. Constant revisiting – chatting research methods in relation to every study, recapping approaches and Biopsychology whenever relevant. Helping/encouraging/requiring students to use revision resources throughout the year, and testing them in a planned or spontaneous way to keep them on their toes. Kahoot or Quizalize quizzes will undoubtedly feature here! The topic matter for Memory, Attachment, Social Influence and Psychopathology may be more difficult to link into new topics but I will certainly refer to it at any opportunity. The students will have to become effective independent learners, and our job is to equip them to do this by providing explicit coaching on effective revision, and pointing them to useful resources. I have reserved a week before Easter for this, to guide them towards using their 3-week ‘holiday’/revision period well. My plan is to whisk them through all the options, keeping strictly to the allocated time and making sure that I don’t over-teach material as it will be the quality of their argument that will matter, far more than the quantity of different evaluation points. This then leaves time to go back to each of the topics after Easter, revising together and dissecting sample answers to learn what will get the marks. The sample extended answers in the Revision and Exam Companions will be invaluable for this. As for Year 1, I am playing with a significant re-ordering of topics, and hoping to set associated independent research tasks during Directed Study periods throughout the year (designing a memory experiment, a questionnaire, an observation, etc) so that research methods can be introduced formally early on, then learnt more deeply through application. I’m excited to be able to mix it all up like this, but my plans may need more refining when I get to know my new colleagues and students. I’m grateful to all my colleagues who have shared their helpful thoughts and amazing resources, particularly via the ATP conference and Facebook page , and Resourcd . Let’s keep talking as our teaching and planning evolve to meet all the known and unexpected challenges ahead. I’m really interested to hear other people’s creative solutions to fitting it all in, too – please share! Rachel’s Year 1 Scheme of Work can be found here and her Year 2 Scheme of Work here. Rachel Moody was a biology, science and maths teacher and examiner for twenty years before becoming a psychologist. She has taught psychology A Level in four sixth form colleges in Hampshire, examines for AQA, and is currently Head of Psychology at St Gabriel’s School, Newbury. 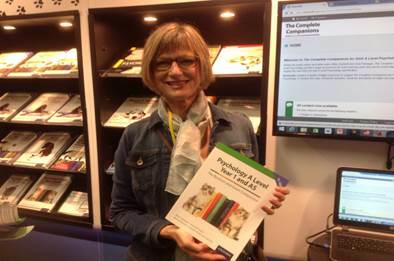 Rachel is one of the authors of A Level and AS Psychology: The Revision and Exam Companion for AQA.